Perfect for a summer day, the refreshing crisp designs of Smart Glass Jewelry fuse modern elegance with timeless versatility, brought to us with quirky distinctive edge. 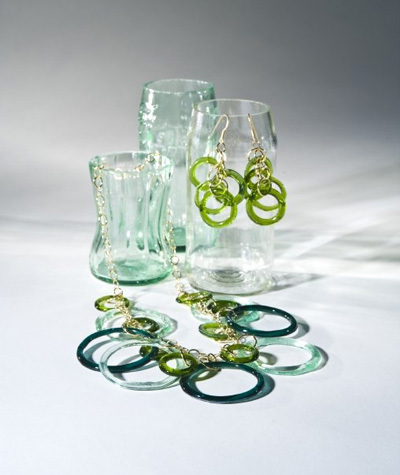 It’s even more amazing to discover that designer Kathleen Plate has crafted her collection of recycled glass JEWELRY from drink bottles, finding a unique fashionable use for beer bottles, wine bottles, champagne bottles, sake bottles, soda bottle s and even salad dressing bottleS- who ever WOULD HAVE IMAGINED THAT salad dressing could be glamorous! 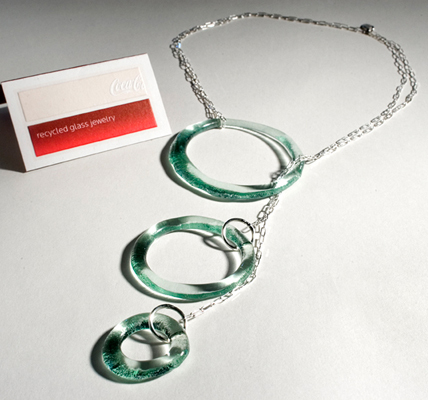 Finding a dynamic way to take recycling to a whole new level, Smart Glass Jewelry is a fun fashionable way to make an eco friendly statement that we are totally buzzed about. The use of glass creates a luminous surface that is brilliantly sculpted and transformed with a modern twist into fascinating geometric shapes combining and intertwining with recycled metals. The collection is marked with exceptional versatility and striking wow f actor, making it the perfect accessory to add a delicate touch of whimsy and mesmerizing originality. Kathleen designs Smart Glass Jewelry to be beautiful in its simplicity and powerful in its message. The techniques and materials minimize the impact upon the environment, yet maximize its impact on the people who wear it. It is Kathleen's hope that her jewelry will raise a consciousness about the small choices people can make in their daily lives, which will inevitably inspire environmentally responsible choices on a much larger scale. Gold Cascade Earrings- What do you do with an empty salad dressing bottle? Make amazing fashion forward earrings out of them of course! These are sure to get the looks with 3.5 inches of recycled glass and gold filled strands and french wires! brass 5 piece bracelet/necklace - This convertable piece is sure to be your go-to piece for all kinds of fashion statements. 16 inches, fully adjustable, recycled glass and antiqued brass. Shown in periwinkle from a sake bottle. 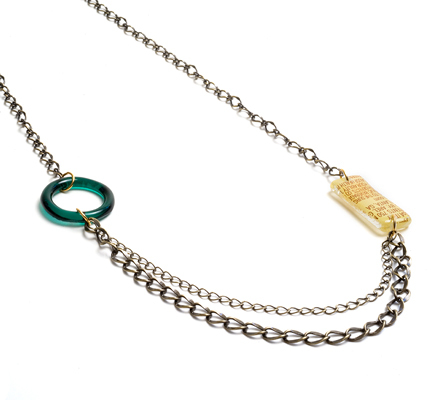 Each piece of handmade jewelry features recycled glass, sterling silver, or gold fill. Look closely. You’ll see some of your favorite products in a whole new light. 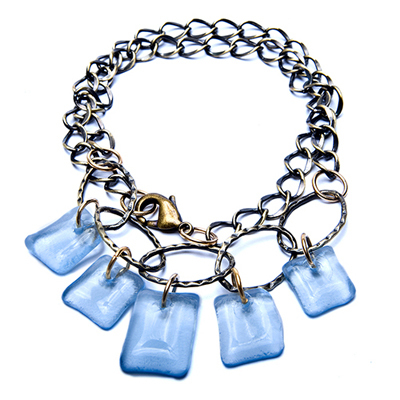 The colorful glass used in this recycled line is individually selected and cut from an empty bottle, ensuring that each SMART GLASS JEWELRY piece is an original work of art.